Finding content ideas can be hard, especially when you’re just starting out and you’re not sure what your audience needs to know. It’s important to make sure your blog posts are catchy and useful – especially if you’re not able to product content super often. The posts that you do publish need to bring lots of people to your site. But how can you find an idea like this – something you know will be popular AND valuable AND bring you traffic for months to come? Let me introduce you to one of my ALL TIME favorite tools for finding content ideas: Buzz Sumo. You simply enter your topic or competitor’s website (or your own!) and Buzz Sumo will pull a list of their most shared content. It’s AMAZING because it easily allows you to see which posts on their website have been the most successful – and then you can use that to your advantage. You now know the topics that their audience wants to read about – and if you’ve chosen correctly, these are the topics your audience will probably want to read about too. If you dig deeper into the post, you can see what they DIDN’T cover or what you can cover more thoroughly to make your content even more valuable. Using this feature on Buzz Sumo is totally free. There is a limit to how many things you can search in a day though (I believe it’s only 10 searches) – so make sure you make them count or you’ll get locked out and have to wait until the next day. You can get unlimited searches with their pro version (as well as a TON of other options) but I’ll be honest with you – I just use the free version. Although I would LOVE the pro features, I just don’t have the time to really dig deeper into all the tools they offer enough to justify the price (one day!). So if you’re thinking that access to Buzz Sumo is expensive – don’t worry. You can absolutely gain a lot from it by using the free version. I love this tool and use it all the time to help me come up with great content ideas. Another way that I LOVE to use BuzzSumo is to analyze headlines and photos – or any trends in the data. If you’re looking at your competitors top blog posts or the top posts in your industry and you notice that they all start with “10 ways to …” or “5 things you can…” then you know that list posts would probably work really well for your niche and you should incorporate more headlines like this. Or if you’re a fitness blogger and you see that most of the popular posts are offering beginner information – this might help you realize that most of your audience is probably still at the beginner level and that’s where you should tailor your content. For the example photo above, I can see that Mariah of Femtrepreneur is really seeing success with her posts on webinars. If I’m targeting the same audience, this tells me that I should at least consider the idea of teaching some webinar skills. 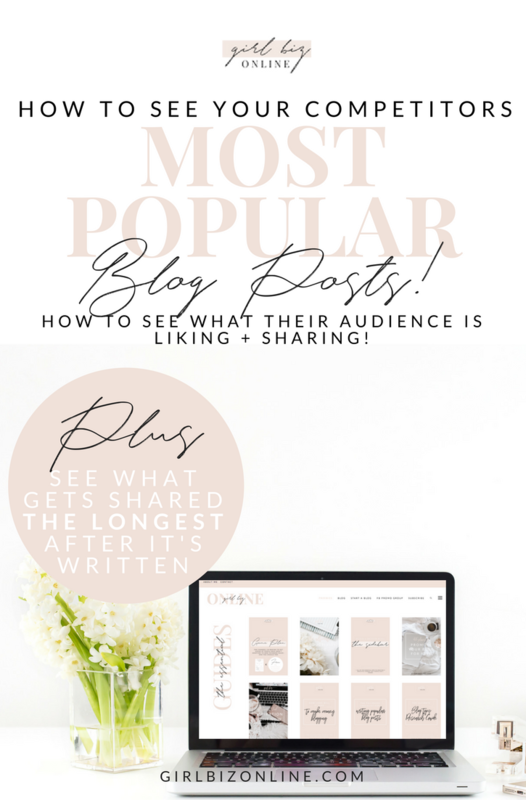 It also looks like her audience for these webinar posts are at the very beginning of their journey – how to start one for free and how to host one – this tells me they’re just getting started. 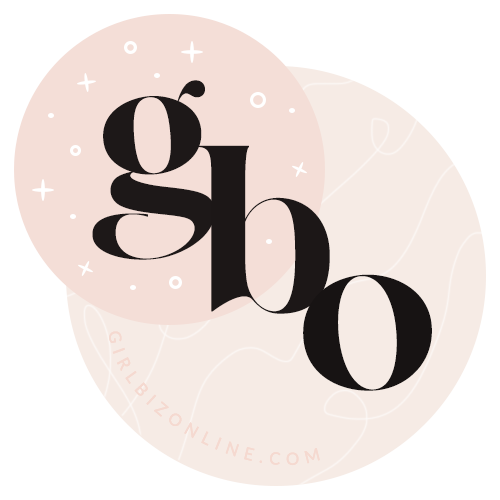 Giveaways are also very popular for her – and probably give a great boost to her email list. Maybe I should consider this too before a big launch to grow a targeted bunch of subscribers before cart open. This is just a basic analysis of one site but hopefully you’re starting to see how you can use this for your business! Look for the patterns and learn from them – what’s working in your space? IS YOUR CONTENT THE RIGHT KIND? I ALWAYS click over to the posts I’m analyzing to see what the person has written on the topic. I never like to write a blog post and be clueless about what other information is out there – I want to know that what I’m sharing is more valuable and not just repeating the same tips you see everywhere else. If lots of people have shared this post, that means they found it valuable. They learned something from it, they liked it, they thought it was good enough to share. So what about it made it share-worthy? That’s what I like to analyze. If I’m writing insanely long and detailed blog posts, only to look at the most popular posts of my competitors and realize they’re shorter and less in-depth – then maybe that means I’m looking at providing valuable content in the entirely wrong way. Maybe my audience actually likes easier to digest, quick win type posts – simple steps that they can read quickly and implement. So for this post, as an example, instead of writing a WHOLE guide on how to analyze your competitors content, maybe it’s easier for you to take this first step and run with it. Maybe a whole guide would be too overwhelming and too long to read. Whereas this idea – using BuzzSumo to get started – is easy to implement and you’ll leave feeling like I taught you something valuable that you can start utilizing. Where I THOUGHT I’m providing great value to you, with an insanely thorough and awesome guide – I might actually be going overboard and you won’t stay to read the whole post or be able to implement all of the strategies. 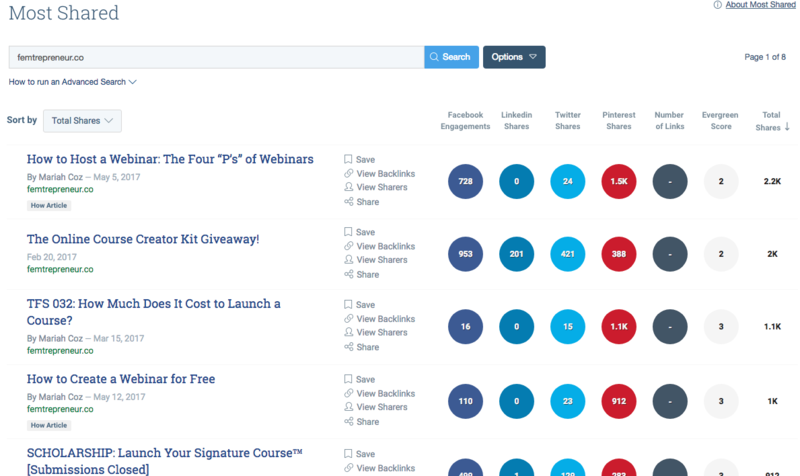 BuzzSumo can help you start seeing what makes content in your niche popular. WHAT MAKES THEIR CONTENT VALUABLE + SHAREABLE? IS IT INLINE WITH THE TYPE OF CONTENT THAT YOU’RE WRITING? Buzz Sumo’s evergreen score is an essential feature to look at if you’re considering writing a post. If a post isn’t being shared long after it’s written, it might not be the type of post you want to write. Especially, as we were talking about before, if you can only post a few times a month. On our blogs, we really want to write powerful content that is still valuable months or even years down the road. Why? Because if these posts are still valuable, they can still bring you traffic over time. If your blog is filled with posts of this type, eventually you will have tons of posts bringing you lots of traffic. This is what we call ‘evergreen content’ and it’s a really important blogging strategy. Buzz Sumo puts an evergreen ranking beside the posts. The higher the score, the content was still being actively shared for longer after it was written. These are GREAT kinds of posts to emulate if you’re looking for a KILLER blog post idea that you can drive traffic to again and again. I would also say that you should DEFINITELY put an opt-in on these posts so that you can turn this traffic into subscribers. Evergreen content is the key to steady traffic growth. Make sure you’re posting a good amount of it! Sometimes posts are unpopular – not because they’re not good but because they’re not getting found. The same is true in the reverse – sometimes posts are popular, not because they’re amazing, but because they’re targeting the right keywords, using the right language and right images to be seen. Watch the words that are being used in these post titles. The keywords being used can give you a hint on some keywords that may be effective for you to use. Images in these posts can also be important – especially if they’re getting a lot of shares on platforms like Facebook and Pinterest. How do they create an eye catching graphic that gets people to click to their post and gets re-pinned or shared on Facebook? Be sure to look at the social media sites that are getting the most shares for each type of post. It might help you identify what platforms are really working in your niche OR what types of keywords and images work for different users. If you’re going to go for a post in this keyword, you’ve just found a great site that you can potentially backlink on. Once you’ve written and published your post, you can go back and leave a thoughtful, detailed comment – while linking your content if you can. Now you’ve got a link to your site on a popular page – this can help increase your own traffic and SEO ranking. One thing to note about this: you should only do this if you do it with genuine support. You don’t want to be piggybacking off the success of bigger blogs and trying to take from your competitors. The online biz world is a small one – and you don’t want to be known as that type of person in your space. It’s not wrong, however, to leave a thoughtful, kind comment and refer people to your post for a different perspective or updated information. I never leave an actual link to my post in my comment – I only put the post link when the comment section asks you for your website URL. That way people can find me if they’ve liked my comment enough to click my name and follow me to my site. It just helps me avoid spamming someone else’s business – I never want to do this or use their success for my own gain. It’s about helping one another. I leave a comment and potentially I get some views in return. Win-win. Now that you have some awesome content ideas, you can get creating some great blog posts to match. 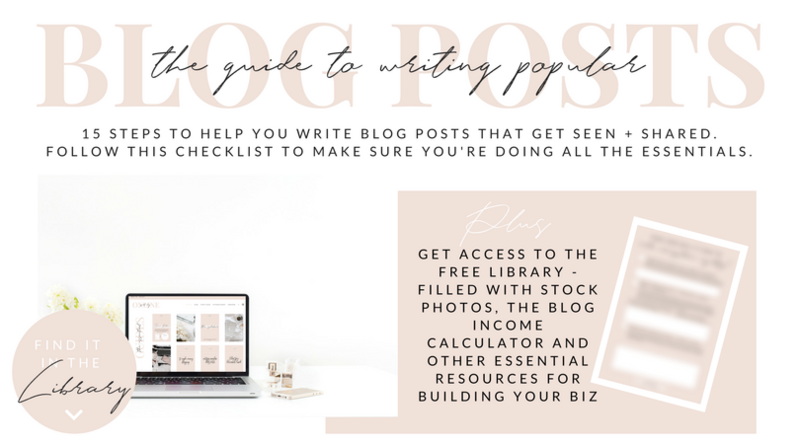 Grab the guide to writing popular blog posts in the free library! Love the advice you give in this post! When I help clients with social media marketing I always tell them to check out their competitors using buzz sumo! It’s such a great way to see what others in your niche have written about and maybe aspects they forgot to cover they can fill in the blanks about! Absolutely – it’s such an awesome tool and once you’re used to playing around, you can go even deeper into analysis. And it’s mostly free – which is such a win for people who are just getting started and who probably need this tool THE MOST. Thanks for your insight! I love these tips, they are definitely helpful. I need to take the time to go back and evaluate my content to make sure the majority of it is evergreen! Great info! I’m new to blogging and appreciate all the insight. Hey Jill – I’m glad you learned something. This is PERFECT for someone new to blogging because they don’t yet know what their audience wants to hear or what works in their space. I definitely recommend using some BuzzSumo searches to see what your audience might be looking for + is responding to 🙂 Best of luck with your blogging journey – you got this! Such an awesome post! Will definitely check that site it in the future. Thanks for sharing! Thanks Hannah – I hope it helps you! It’s definitely a tool to keep on your radar! Ps – your website is gorgeous!